You can create a great ad, but if you don’t reach your target market in a powerful way they will just pass it by in their feed. Which is why this particular Facebook Ad course has a very different DNA. I’m a marketing consultant who creates Facebook ad funnels for businesses (this is how I make a living). First, I share with you my personal processes, golden nuggets I have learned through trial and experiment, and also my personal strategies. Secondly, I study neuromarketing which is the use of modern brain science to measure the impact of marketing and advertising on consumers and I have engrained these teachings in my course. I take you to the core of the core of understanding how to sell to humans. I skip a lot of the fluff and take you to the heart of how to create an ad campaign that creates leads. My objective was to take a person who has never seen the Facebook platform before and have them up and running their own Facebook campaign in a flash. I take you all the way through the process of installing your tracking pixel, setting up custom audiences, and finally creating a great ad. I also explain to you what each part is in detail and the impact it has on your business. Here I will explain to you exactly what the pixel is, how it works, and exactly what it means to your business. You will learn how it tracks everyone who clicks on your ads and even down to specific actions. Additionally, how you use this information to retarget your audiences and double-purpose your Facebook ad investment. The FB tracking pixel is the literally the equivalent of taking your finger and putting it on the pulse of your ad efforts. We will discuss cold, warm, and hot leads and how you attract each one with your Facebook ads. Here I will show you step-by-step how to locate your personal FB tracking pixel. You will need a Facebook ad account to be able to access this feature. It’s a very simple and painless process I promise! Here we will place your Fb tracking pixel on your WordPress website. It sounds scary but I promise it’s very a simple and quick process. I will show you step-by-step how to upload a plugin that will show you how to activate your pixel. Here we will make sure your pixel was loaded probably and activated in your Facebook ad campaign. I will take you through the step-by-step process. In lesson 4 I take you through a process to make sure your pixel was firing properly. Now we’re going to ad an additional layer of double reinforcement. If you ever find yourself using your pixel on pages outside of your website for example in a platform like Leadpages, you will need to make sure your pixel is firing correctly. The Pixel Helper which is a free chrome extension which is a great indicator to assure you it’s working properly. Here I will show you step-by-step how to load your tracking pixel into your Leadpage(s). You will want your tracking pixel on every page including thank you pages. In module 1 you learned about the Facebook retargeting pixel. Here in module 2 you’re going to learn how to use it. Targeted marketing on Facebook is very powerful and custom audiences is how you leverage that power. Custom audiences are great for creating warm leads. Warm leads are significantly less expensive than cold leads which means you’ll have a much lower click through cost. As a bonus you also get a behavioral marketing lesson as I explain to you a couple of very important fundamentals when it comes to selling something to your target market. We’re heading to the Facebook Ad Manager to learn to create a custom audience. I will show you how to create a custom audience and educate you on the importance of creating them before you start your ad campaigns. I will explain to you how to track data over various time frames and the value of doing it. We will also talk about creating a Lookalike audience. This is where things get interesting! If you have a sales funnel or some sort of opt-in page for leads then you have multiple pages that need to be set up in your custom audiences process. The consideration is not everyone that clicks your ad or opt-in form will sign up. That doesn’t mean they aren’t interested. It could very well mean they got sidetracked. It can be an important part of your campaign to retarget people who didn’t opt-in for whatever reason. Here I will show you the process of how you track that information using custom audiences settings. Here we will create a custom audience from a list you have which can be a customer list of some sort or it can be a prospect list - perhaps a list of people who are in your sales pipeline. Let’s say you have a customer email list - staying in front of your list is very important. You can create special offers just for existing customers, use this as a tool to promote an event, I can go on and on. There is no limit to how this amazing custom audience tool can be used. This will be our final lesson in creating a custom audience. Here we will talk about the option of using engagement. There are tons of ways you can target various types of engagement which is so awesome. We will also talk about Lookalike audiences and how to use them. Additionally how to create specific audiences and save them. Images are a very important part of your Facebook ad and here we will get into a little neuromarketing so you understand what types of images to use. Your target market has a very short attention span and you’re competing for their attention in their Facebook feed. 90% of the information transmitted to our brain is visual. Here I will share with you several tips to make sure you use an image that will cause your target market to take the action of clicking your ad. Here I will introduce to you a free application I absolutely adore! Using Canva you can create a gorgeous Facebook ad even if you aren’t a graphic designer. You will learn various ways you can use Canva to create beautiful and branded ads. Here we will take a little tour of Facebook objectives just so you understand each one. I get a lot of questions about about this and people tell me they are intimidated by this part so I want to address it and make sure you never feel that way. It’s time to create an ad! I will take you all the way through the entire ad process. I will take you through the process slowly breaking down each section and explaining it fully. I will be dropping a ton of great marketing nuggets and little Facebook ad tricks along the way. I will share with you my absolute my absolute favorite Facebook strategy! I call it the 1-2 punch and it can work for any business model. I will take you through this incredible ad set up process step-by-step. This lesson alone is worth the value of this course a few times over. I will share with you my process and the tools I use to create great copy - you are going to get some great nuggets here. If you can’t write great copy an ad won’t really matter so this is just another way of teaching you about Facebook ads from a different angle - the sales angle and copy is a very important part of that. I know copy stresses out a lot of people as I have heard this through the years as a marketing consultant and teacher which is another reason why it was so important for me to include this piece. Also, you’ll find I will talk to you about this in a way you won’t only personally relate to it but you will enjoy it. This lesson will reach well past your Facebook ads here I will share knowledge and tips with you that you will use in every facet of your business. The Facebook algorithm collects thousands of attributes for every member which manifests in your ad platform through targeting and interests. To get the most of your Facebook experience you need to understand how the algorithm works which we will discuss in this lesson. Here in this lesson I will answer this but on a much deeper level. Here you will learn the value of knowing what a new customer costs your business. Also, why asking how much should I spend on ads is actually the wrong question. There are several ways to optimize a campaign, it can be for engagement, clicks, traffic, or conversion. Which one you choose is based on what your goal is. What do you want the campaign to accomplish? Here we will talk about campaign examples and how they are used. What are you waiting for? Push that purchase button! You must sell your products and services to enough people to sustain and profit in your business. The success and profitability of your business relies on reaching customers. Learn to use Facebook today to create more profit in your business! Ready to Get More Leads and Grow Your Profits? 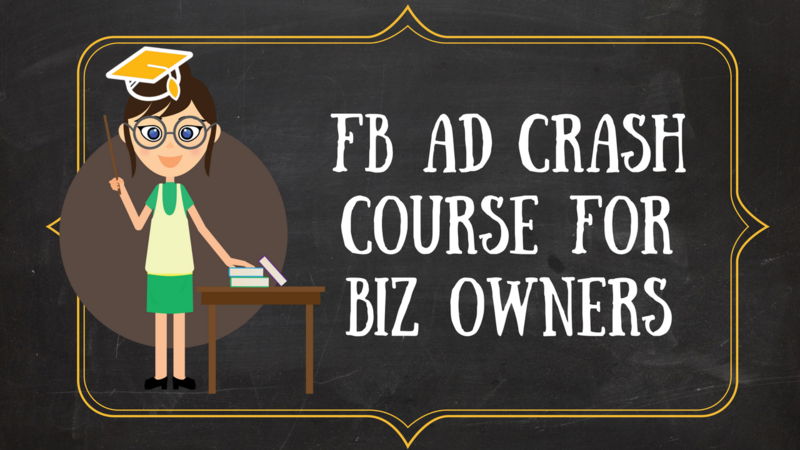 The FB Ad Crash Course for Biz Owners is a no fluff, straight to the good stuff education if you're ready to use Facebook to get more leads for your business. Purchase it today, have your ads up and start getting new customers tomorrow!